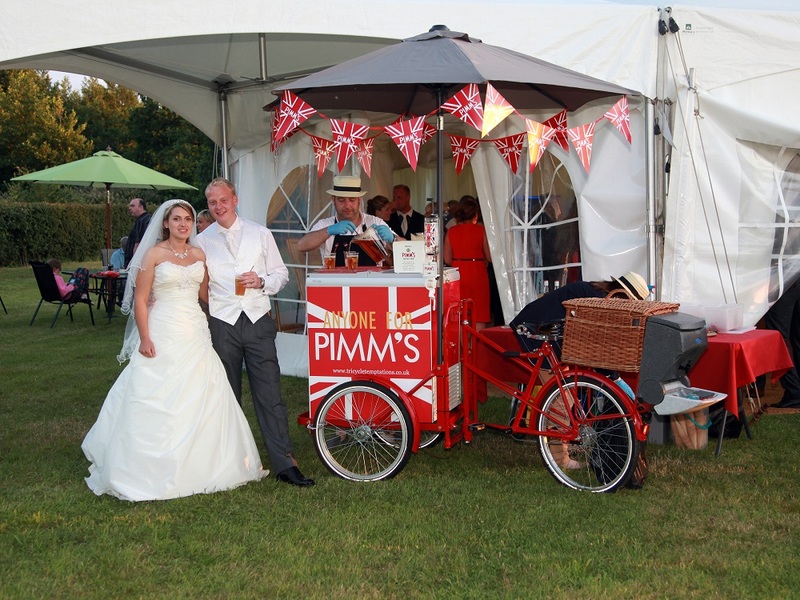 Tricycle Temptations is a Norfolk-based company specialising in providing classic style tricycles for your special event. Not only do the carts look amazing, they dispense a wide range of delicious beverages! The flagship tricycle serves refreshing, ice-cold Pimm’s with all the trimmings while the rest of the fleet can provide ice cream, champagne, strawberries & cream, hot dogs, crepes and more! Paul and Jaclyn offer a professional, flexible service enabling clients to select their beverages and have them served by uniformed staff. The traditional style of the tricycles makes them a fantastic talking point at weddings, parties and corporate events. 1,000 servings can be achieved from each tricycle and with several in the fleet, Tricycle Temptations can cater for events of all sizes. Keep your guests refreshed all day or welcome them to your special event in style – the choice is yours!